Ever notice that most end up with a too stiff arrow? I am guilty myself because I have shot mostly Bows cut close to center shot and get by with it. Guys who shoot Bows cut outside of center may not know that they need less spine in many cases to have the proper S curve to clear the riser. Take the time to tune, get the proper arrow for you Bow set up. I tend to want to make my too stiff arrows shoot in what I have and end up adding tip weight. I think the radical FOC thing makes many forget regular heads, like 160 and under with factory inserts require less spine or forget that fletching adds spine. I see it on all the forums this time of year when people are tuning for broadheads. Usually, their arrows are too stiff. Actually, I think that folks have a tendency to shoot arrows that are too weak. Especially in the case of carbon arrows. Too many folks shoot .500 spine arrows with over 200 grs. on the front out of bows way over 6lbs.. The fact that carbon has a faster rate of recovery allows that. But in my mind it's dangerous. As long as you shoot in the draw/force line of the bow, aligning string, complete length of the arrow, and the target, spine is easy. It's when folks mistakenly interpret how arrows actually react that causes them problems. That's why we see so many therads where people are "chasing spine". Any of the major spine charts are virtually on the money. Spine isn't as critical as most folks think any way as long as the spine is consisten within the group of arrows we are shooting. Oddly enough, most folks don't understand that arrows fly in a straight line. They only bend due to the acceleration caused by the stirng when it is released, and the affect of the string rolling off our fingers. I have to agree Sam. I have seen a lot of people shooting over spined arrows at our club. Sam, you’re right on. It’s more money but a lot of folks should get test kits, shafts and points. I also believe it’s gets more confusing getting the right spine while trying to achieve a high FOC. A person using the spine calculator for the first time may not realize it can be manipulated. Then there’s form issues, etc. But when people do ask questions I know I think about my setups. I believe the posts help everyone. I learned a few things especially about Bowstrings. I sort of agree with Frank - the tendency to front-load shafts makes me a bit nervous. Yeah, it may improve penetration but there's a real imbalance of forces acting on that shaft. 250 grains up front and thirty on the back, going through rapid acceleration and paradox? I'll stick with 7-10% foc, tyvm. It's been an epidemic for years...I suspect guys coming from compounds that were cut way past center. Anyway, I agree with Sam as it applies overall. I can only speak for myself, but I had a bad tendency towards getting myself over-spine in part (I suspect) because I thought that arrows of what turned out to be the correct spine were just too wimpy to count as “Real Hunting Arrows”. But fortunately, I got over myself… All I really care about now is that they fly straight down the middle with no fletching on ‘em. That said, I do have to agree with those who say that bare-shaft tuning is a fool’s errand if you can’t group worth a hang in the first place. For anyone new to the sport, I would recommend just getting pretty close with the spine chart or a calculator and letting some big old feathers do the rest. That should hold most of us for a good while! Yep. Agree with Sam. Big fletching will easily stabilize an overspined arrow. Most carbons should only need 3" fletching to stabilize a correctly spined shaft. Woodies are a different story. Actually wooden arrows are no different if they are quality made shafts and spined correctly. Nor are aluminum, or any other material. Years an years ago Dan Quillian shot, and had other people shoot 1,000's of bare wood shafts to work out the nuances of wooden arrow spine for his own purposes. 50lb selfbow, 7/16ths out from center, B50 string, arrows spined at 60# 27" bop 145 gr broadhead. Perfect flight and blew through this deer at 7 yards, stuck in the ground on the other side. He walked 20 yards and dropped. I used to believe the everyone is shooting to stiff and arrow theory. I don't anymore. If I can't shoot an arrow at least #20 overspined, I am not shooting the bow correctly, regardless of center shot or lack thereof. But are you "20 pounds" overspined on both? Walk back on the arrow at 20 yds, 30 yds, 40 yards? Are you advocating that correct spine by tuning a bareshaft to the Bow is a fallacy? Kudos on the great trophies! It is also my observation that people use stiffer arrows than needed. This allows the shooter to add the weight desired up front to gain foc or extreme foc without having an incredibly heavy rainbow trajectory arrow. Sure, it has worked ok with out much foc, but it works much better with more foc. Those that rely on changing point weight to bring a poor flying arrow around are also missing the point (pun intended). The proper shaft spine and length will not respond much from chaning point weight except trajectory. However, shafts that are ill tuned for the bow will respond considerably by changing point weight. An arrow leaving a bow straight forward or close has the point pulling the shaft straight forward and doesn't have to fight with feathers or bare shaft to straighten out. Thus changing point weight will have less impact. An arrow leaving a bow at an angle has to straighten out and will have varying difficulty as point weight changes. If they're right handed the shaft is impacting way left when they make a good shot. With being new their form is not that consistant, but it's FUN. After time maybe their form gets a little better, but what's worse is their brain takes over the aiming/impact. The brain knows were the arrow is supposed to go so it starts aiming right. Most are shooting an arrow so stiff it doesn't go into paradox and therefore the bare shaft flies straight. Put a vertical line on a target and a right hand shoot is going to impact left of the line, when shot with the arrow tip on the line. I hold the bow in such a manner the string is driving the arrow to the target in a straight line... not to the center of the bow. Jim Ploen taught me how to do that , the amount of center shot or lack there of is irrelevant. Thats why I don't bare shaft or believe in it at all. I shoot what I am going to shoot and get the arrow to fly with the feathers on the shaft. I shoot all arrows out of every bow I shoot. Alum, carbon or wood. I just test out what works for me with weights and spines. On carbons if I have to add a little weight up front I will at times. I never modified bow shelves or any of that either. The bow wasn't built to have that done to it feel. I learn to get my arrows to fly and learn what arrows for my bows they like best. I have a lot of arrows so I can test pretty much anything i need out of any of the bows. I love carbon arrows but at times with lighterweight bows especially, I go back to aluminum and just feel I can tune the bow easier with the amount of spines offered in aluminum arrows. I do the same thing as Ryman Cat...I have a wide variety of arrows and I match them to the bow. Write it down and I am good to go. Nice buck and picture Paul . When they kick w feathers and field points you know there is a tuning issue. Ive seen this often at organized shoots. Bad advice from " pro" shop staff that are oriented toward the contraptions are a big cause of this. Ive seen many more shooters overspined than under, for sure. Many don't spend any time tuning. Agreed that closer to center cut bows will shoot a wider variety of spines. The string and arrow are more linear. The string and arrow become "linear" based on the way that the archer addresses, or holds the bow. A bow that is gripped properly should have the entire length of the arrow in line with the target from string, through the point, to the center of the target. If that's NOT what you see when you draw to your "sighting reference" it's not really an anchor, then you are holding the bow incorrectly. That's what folks call torque. Any bow will EASILY shoot a wide range of spines provided you hold it correctly. And as Hal can attest, consistent weight among a group of arrows is far more important than perfectly matched spine. Particularly inside of 30 yards. The arrow tip OUTSIDE the string is ONLY a starting point. And if one actually reads the entire Easton tuning guide, which is where that idea was popularized, it plainly tells you that if you shoot, and the arrow impacts left of vertical, you move the plunger, or sight window material IN which moves the arrow tip to the right. Typically putting it either dead center of the string, or slightly inside. The tip of the arrow ALWYAYS needs to move the direction that you want the vertical impact to move. And it needs to move that way while the arrow is on the string at brace height. Setting up with the arrow tip OUTSIDE the string, and having the string left of the vertical center, with the arrow point on the center, means that you are shooting a weaker spine than you need to. Which is fine, if that's what you want to do. But it isn't neccessary. The stiffest spine that you can shoot from a bow with your form is the spine you should be shooting regardless of the material. Stiffer arrows simply recover from the initial bend more quickly. Which is the end goal. In the vast majority of cases, when an arrow is "slapping" the riser as it passes, it's because of the way the archer is gripping the bow. FDP, the arrow for a right-handed shooter is adjusted outside the string so that, due to paradox, it starts out in the right rotation. "Slapping" the riser is usually caused by too stiff an arrow. Sam, you are correct in that the arrow outside the string is the traditional "staring point". Not neccessarily the ending point. I said that in my post. I also agree that the string rolls off your fingers, causing oscilaation. And the less oscillation. the better the arrow flight. That's why people work so hard on alignment, and having a release that has as little affect on the arrow flight as possible. Absolutely none of which has any bearing on anything I said. As soon as the string leaves your fingers it begins moving foward down the center of the arrow. And it doesn't have anything to do with where the arrow is in relation to the inboard or outbard side of the string. And it doesn't have anythig to do with the front and back being aligned when the arrow leaves the string. The arrow is going in a stright line that is based in where the string and arrow point are in relation to the target. If the string is right of the target and the arrow left, unless the arrow is weak. it is going left. If the string is left of the target and the arrow right, unless the arrw is stiff, it is going right. as well as trying to return to the line inwhich the string bisects the limbs of the bow. Which may. or may not be exactly in the center of the limb, and the grip. Now, I'm not trying to concince anybody, of anything. For instance that most people shoot arrows that are too stiff. I don't agree with that, and that was the opening question. 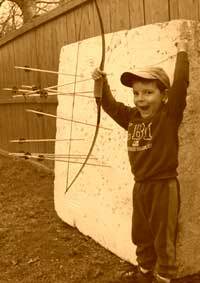 I will say that if you read, Hill, Asbell, Quillina, Ploen, and many others all of them say that there are lots of arrows that are not stiff enough, few that are too stiff. And no, they aren't all talking about ood shafts. Anyone s free to beleive whatever they wish to beleive. But my suggestion would be that they go out and experimet for themselves rather than relying on general consensu that is in many ways wrong. Learn to hold the bow correctly and you will get much better arrow flight. People make this stuff WAY too complicated. Well, You must have an understanding of bow mechanics to understand what happens with a finger released arrow. The closer to centershot your bow is cut,a wider variety of arrow spines it will shoot on the stiff side of spine. You need also to understand that paradox causes an arrow to bend in the horizontal. Did you know that C Now shooters adjust their rests to centershot and the arrow flexes vertically instead of Horizontally? To understand what an arrow does with the finger release is the first step to understanding why spine is critical to good arrow flight. A properly matched arrow will bend around the riser and make an S curve without contacting the rest or shelf. I stated that a too stiff arrow will likely be the culprit to hit the riser and not pass cleanly. The initial rest adjustment will change things. Moving the strike plate or cushion button outward weakens an arrow because we have taken a linear shift off the back of the arrow and made it stiffer. To understand that is the beginning of the tuning process. To move the arrow inward puts more dynamic pressure on the entire length of the arrow and moves the nodes further apart. Static and dynamic arrow spine is only a beginning in the tuning process. If you move an arrow inward of centershot, you will have erratic flight because now you have started the arrow in the wrong rotation coming out of the Bow. The closer to centershot you move the arrow, the better your release has to be. You need to understand that if you cant the Bow over to the right with a stiff arrow, it will shoot high. Raise it vertically and it will shoot left. Weak arrows will shoo right. It is all basic, cannot understand you debate such simple knowledge? If you advocate a stiff spine, get ready to compensate by aiming to the right or cant your bow over to the right radically. Why not just get the right arrow spine and shoot straight? An arrow for hunting will penetrate much better if it enters the animal straight. "Moving the strike plate or cushion button outward weakens an arrow because we have taken a linear shift off the back of the arrow and made it stiffer." Correction stiffens when you move it outward. Sam...I understand exactly how an arrow works in relation to the string with fingers, thumb ring and a mehcanical release. And whether they are used on a recurve, a longbow, or a compound. The arrow doesn't bend AROUND anything, that's one of the great fallacies of archery. It simply bends. Because it is at rest, and is suddenly hit with a consedrable force from behind. It bends as it does because it can't bend THROUGH the riser. Your arrow nneds be no better with an arrow closer to centershot, than an arrow outside of center. In fact, the reverse is true. Like I said, do as you wish. Buddy called me last hunting season... said he was having a bad year. 6 shots 4 misses and 2 hits with little to no penetration. 40-45lb 60's recurve, dacron string shooting 2016s with 125gr heads with vanes off a flipper rest, brace height was to low I thought) Grabbed the bow the string laid clear to the right side of the riser???? I put my hand much deeper into the grip and it rolled the string to the left inline with the arrow. Arrows flew straight to the target and he said they penetrated much deeper. 3 days later he made a great shot on a nice buck... success. I told him we would work on the grip before next season. He had a repeatable grip like a suitcase handle. Learn to shoot with the proper hold and you can shoot any bow said the Indian. you missed the point Sam... you usually, do unless it is yours. John Lee said Hill told him the secret is in the hands... and it is. Good topic, like the different "views".